Author steinsaltzPosted on January 14, 2017 January 14, 2017 Categories Personal reflection, SocietyTags generations, history, technologyLeave a comment on P.S. Ein Großteil der Wähler der Grünen ist fest im Bürgertum verwurzelt. A large portion of the Green voters is securely rooted in the middle class. “Middle class” is only a weak translation for the German Bürgertum, with its undertones of right-thinking and class struggle. And the Greens (or rather, their voters) have not only made it, they are even “rooted”. There’s enough condescension to power a whole revolution right there (except that the Greens and their voters are too middle-class to revolt). So, the expansion of the “married” segment of the population as we go from left to right reflects in part the typical development of a human life, but it reflects as well the fact that we are moving back in time, to when people were simply more likely to marry. 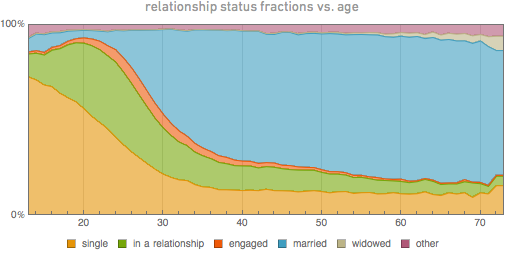 And the absence of a “divorced” category masks the fact that while the ranks of the married expand with age, individuals move in and out of that category as they progress through their lives.